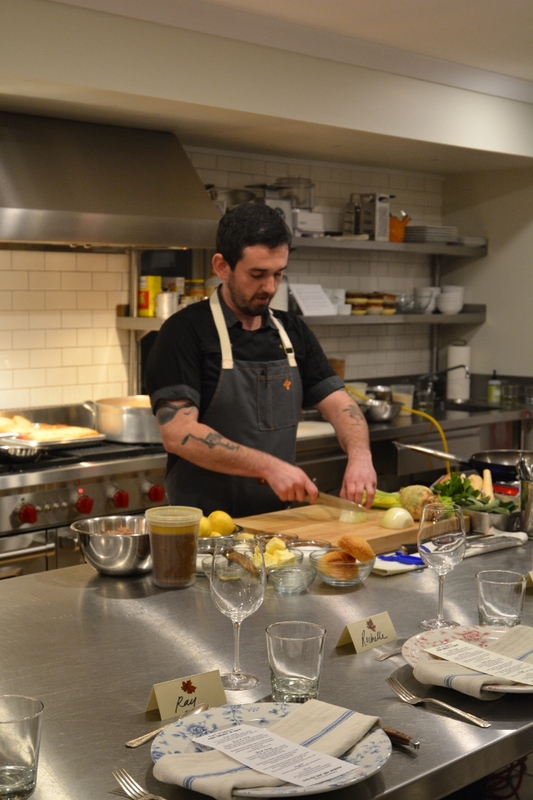 You can see that Chef Sean Spradlin is not afraid of showing off his skills. We were invited to sample a large helping of Eat Purely’s new menu items. If you are not familiar with Eat Purely and you are in the city of Chicago, then you should be. This is an app based company that offers healthy meal options delivered to you in 20 minutes. Everything is made that day. After being cooked, the dish is cooled down and packed. The meal you order will look like the picture in the app. This is no false advertising. So, it won’t have the plate, but it does have the same portion and ingredients as the picture. You can see from above and below that the dish doesn’t lose integrity being portioned as one serving. Both of these are the same turkey pot pie recipe only scaled to serve a certain number of portions. The one above feeds around three people, as we discovered. Hard to believe, until you realized that the chef really likes to cook all out. We were tortured entertained with an abundance of food. Seriously, this was “three” courses but it felt like eight. 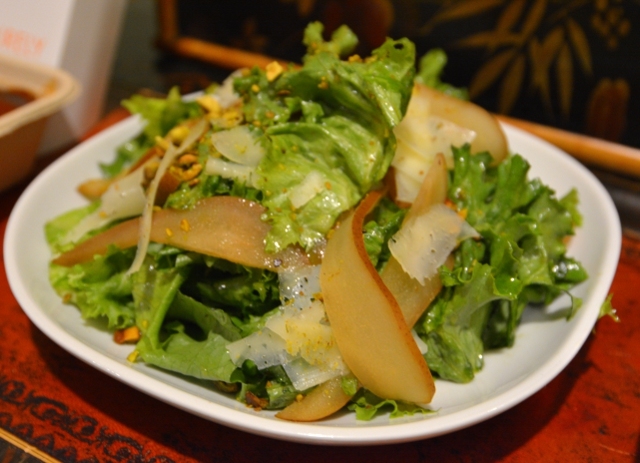 The salad with pickled pears, pistachios and basil vinaigrette is delectable. Had we known this was the beginning of our foolish downfall; we all would have paced ourselves. 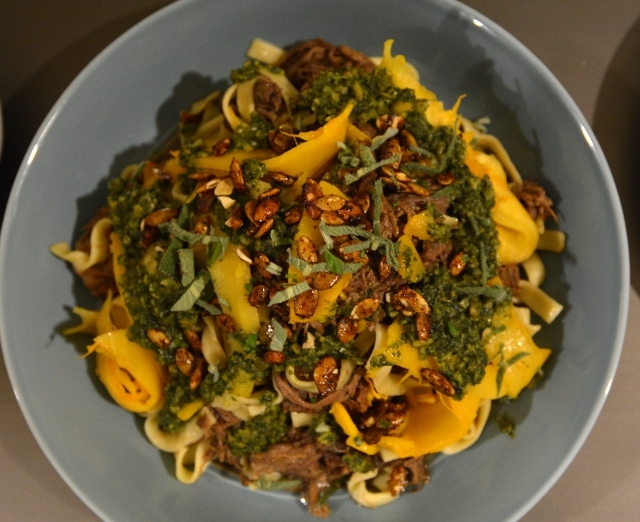 The second course consisted of tagliatelle with braised short rib, roasted pumpkin, pumpkin seed pesto and spiced pepitas along with roasted broccoli with golden raisins, almonds, parmesan and lemon-thyme vinaigrette. Again I found myself not hating ingredients I tend to avoid. Mainly pumpkin flesh and golden raisins. The secret really is in the preparation. This was the second red flag to go slower with our eating. Soo many golden raisins. 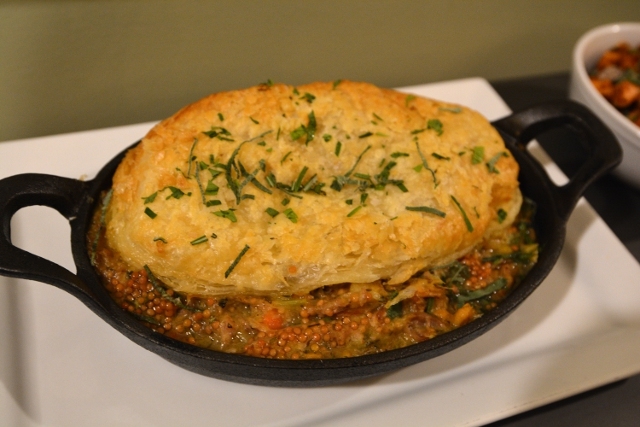 The third course had us finally tasting the turkey pot pie after being tormented with a demo by the chef. 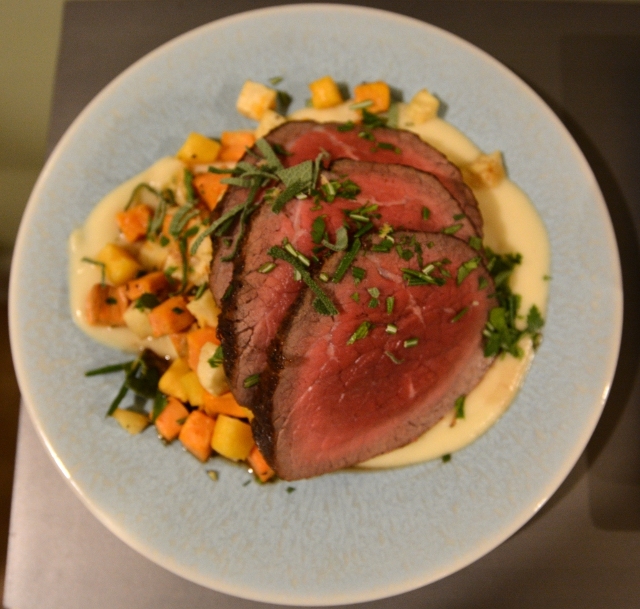 Along with sesame green beans, roasted almonds and onions with buttermilk dressing, and herb crusted beef eye of round with parsnip-garlic puree and winter root vegetables. All of this was excellent even more so than the salad. We had been fooled into filling our stomachs with a surprise appearance of spicy sweet potatoes and candied pecans. By the time the beef made it to the table I didn’t have enough room. The torture of finishing that slice was awful because it was by far my personal favorite. 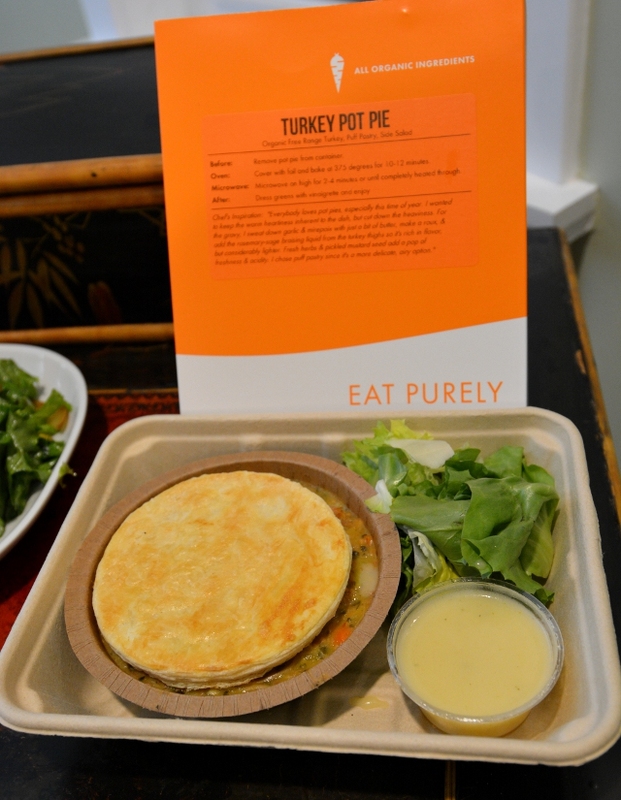 Something I refused to say aloud because everyone was lamenting that the turkey pot pie was beyond amazing. Relief came in the form of golden bullion. Well, not actual gold bullion but the next best thing. 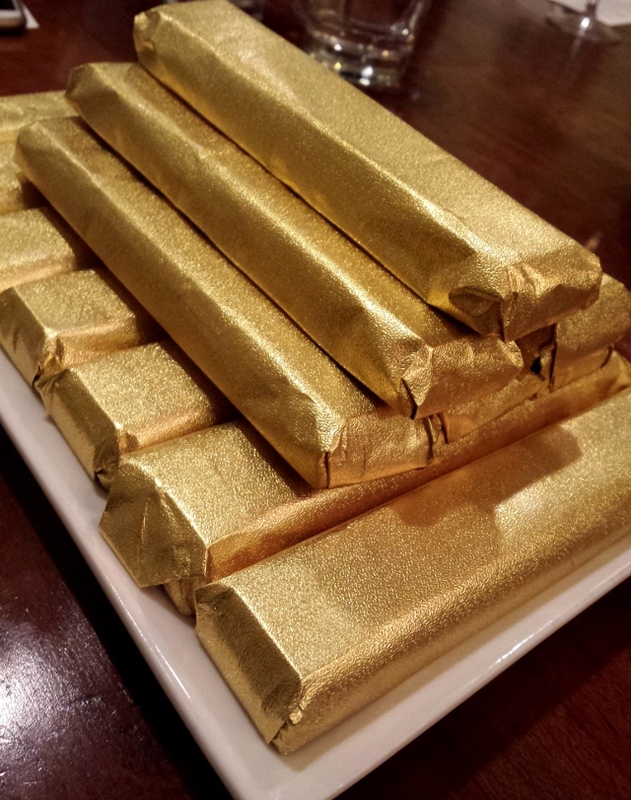 Candy bars to go that were semi-sweet chocolate filled with toasted honey almond nougat. The likes of which break into perfect segments like that famous European candy bar. Only this bar promises to debut on the Eat Purely menu. So while I don’t yet live in an area where Eat Purely delivers, I will certainly use days I must be downtown as excuses to get lunch delivered. They are extremely healthy and delicious food for the same price you would find on any lunch menu. The menu can easily be divided by nutritional restrictions like gluten free and dairy free. Every ingredient is sourced locally. Chef Spradlin is big on filling people up until they can’t walk but also not wasting anything. The best part is that right now when you sign up and refer someone you get a $20 credit in the app. That’s almost two whole meals for free! Everything comes with reheating directions and if you mess up they will even replace your meal at no cost to you. They take their food seriously so you can just enjoy it. Also we learned that Chef Spradlin really likes to feed people. 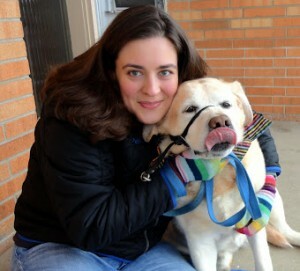 Saying no is hard but we can do it easier with the app. Just one serving for me please!